I'm progressing in my quest to fill in the broad purple expanse behind my bed. I painted my $4 half-round shelf and hung it on the wall as a bedside table. It's perfect! I decided to hang fabric behind the bed. I love my window curtains and was hoping to use the same behind the bed, but the store doesn't carry them any more. I ordered some that I hope will be very similar. 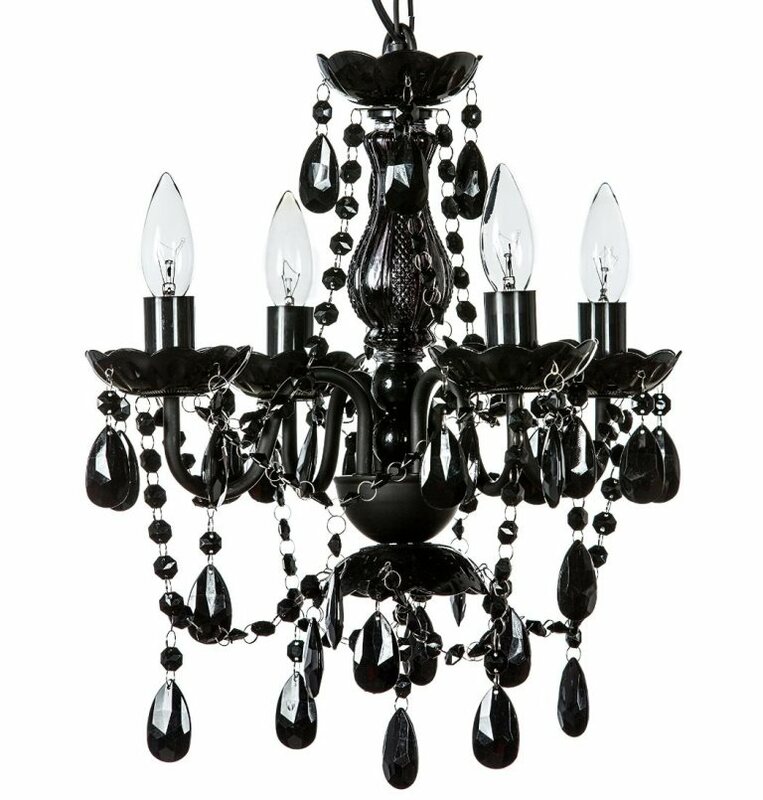 The exciting addition is a black chandelier with black acrylic crystals. I LOVE IT. I'm not sure about the placement, though. I hung it to use as a bedside light, and it works great for that purpose - the height is good and it provides plenty of light. But maybe it looks weird there. 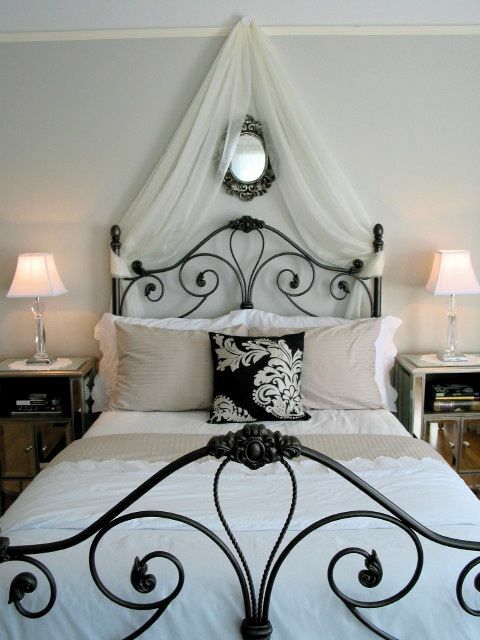 Normally a chandelier would be in the middle of a room, but there is no overhead light fixture. Or there would be matching nightstands and lights on both sides of the bed; however, my room is too narrow for two nightstands. Does the chandelier look weird there? What do you think? Another review, this time for a totally different product: body lotions. I have naturally dry skin and live in a dry climate where indoor humidity is often below 20% in winter. Thus I need a heavy-duty lotion, particularly for my hands. It's a bit thin and not moisturizing enough for me. It might be good as a body lotion in warmer weather. It tends to sit on my skin and takes some extra rubbing to get it to soak in; even then, it feels a bit sticky. I like the fragrance, which is quite noticeable at first but fades pretty quickly. Overall, I'd rate it 3 stars bats out of 5. I LOVE this stuff! It has a thick and creamy consistency. It absorbs quickly, and it immediately makes my dry hands feel softer but not sticky or greasy. The fragrance is subtle and pleasant. It's probably the best hand lotion I've ever used. The consistency varies a bit with temperature (probably because it contains coconut oil, which turns liquid at around 76F/24C) but is similar to petroleum jelly. As with petroleum jelly, it's too oily/greasy to use on my hands during the day. I layer it over lotion at bedtime and then put on cotton gloves. It does smell a bit weird. Overall, it's a good chemical-free substitute for petroleum jelly (Vaseline). *Except circular saws. I am irrationally terrified of circular saws. Jigsaw = useful tool. Chop saw = useful tool. Circular saw = scary instrument of horror straight out of a nightmare. Anyway... I love power tools. I don't often blog about them because I'm not sure my readers share my enthusiasm for drills or pneumatic pin nailers. ;) However, I'm going to write a review of my latest tool purchase as it might be of interest to anyone with a pet. I always had to take my previous dog to the groomer for nail trims. Her nails were thick and black, and I was afraid I would cut one into the quick. I'd be nervous, which made her nervous... the whole ordeal was just too unpleasant. I chose the Dremel Micro. I love it! It is small, lightweight, and easy to hold. It has a nifty charger stand so it's convenient and ready to go when I need it. And it's quiet. On the lowest setting, which is what I use for the dogs' nails, it's barely as loud as my electric toothbrush. Okay, so it doesn't take much to sell me on a multi-function power tool. ;) The real question is: How do the dogs like it? More specifically, how does fearful Nook like it? Nook is afraid of EVERYTHING. Not just the usual suspects of fireworks and loud noises, but anything and everything new. Set an object on the floor, and she reacts like a monster was released into the room. So of course, she was scared of the Dremel initially, even before I turned it on. But with patience and lots of reassurance, I managed to convince her it wasn't a monster. Then I managed to convince her to sit still for a couple of minutes and let me file a few of her nails. Now, after a couple more sessions, she isn't the least bit afraid. I did all of her nails this evening, and she didn't protest at all; in fact, she practically fell asleep. I am absolutely thrilled! I will be able to maintain both dogs' nails with no fear and a minimum of effort. It truly is a huge relief. 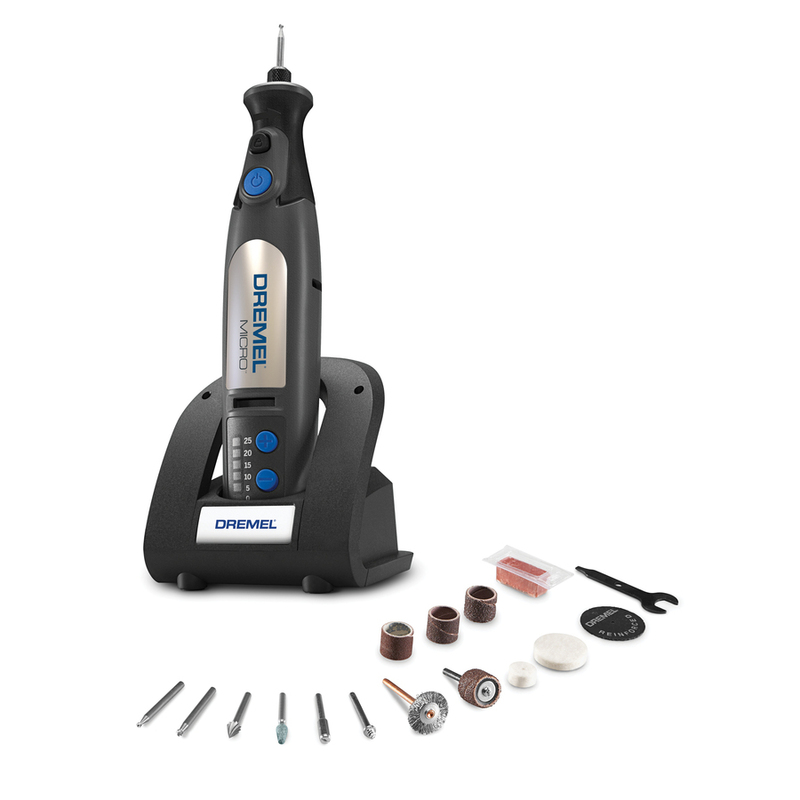 Anyone else tried a Dremel or similar tool for their dog's nails? Not a rant about short pants, but a short rant about pants (jeans, actually). I lost a few pounds and my jeans are too big. Much too big. I can take them off without unzipping them. I went to the same store and bought the same brand, same style jeans in the next size down. They're too small. They're so tight, the fly doesn't lie flat. Thank you, jeans maker, for giving me choices: Falling Off Loose or Immobilizing Tight. ARGH! This is why I hate buying pants or jeans. Though I was shopping mainly for my bedroom, there were a couple of other "wants" I was keeping an eye out for. One was a cabinet-style side table for my living room - and I really got lucky on that one. I happened across a pair of tables in excellent condition. They're the perfect size! They were $20 for the pair, which would have been a good price... but it was 50% off sale day, so I paid only $10. :D Score! And I've just been hearing fireworks, so I assume the Broncos won. Now that I have painted my bedroom furniture, I'm trying to maintain my focus on projects for that room. It would be wonderful to have one room in the house completely finished! Most of the remaining projects are related to decor or lighting. After collecting lots of ideas on how to fill the expanse of purple wall behind my bed, I'm now narrowing down the choices. I really like the idea of using fabric, possibly sheer or lace. Perhaps something like the photos below, but in black instead of white. 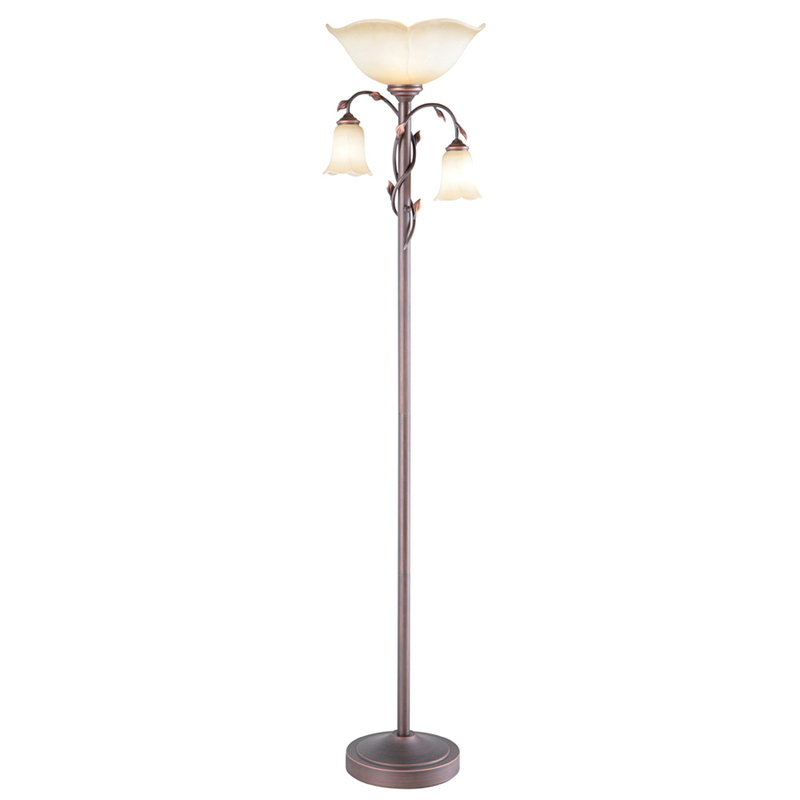 As for lighting, I want to replace my cheap, boring floor lamp with something nicer. Lowe's carries a torchiere that is very pretty; however, the globes on the side lights are shorter than light bulbs, leaving half the bare bulb visible. That really irks me. I'll have to see if there are smaller bulbs I could use. 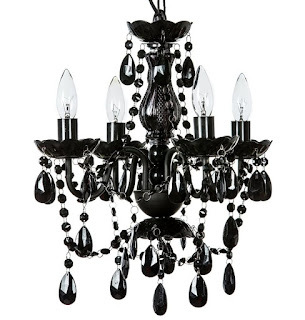 I'd love to have a black chandelier somewhere in the house. Would a small one work as a bedside light, perhaps? 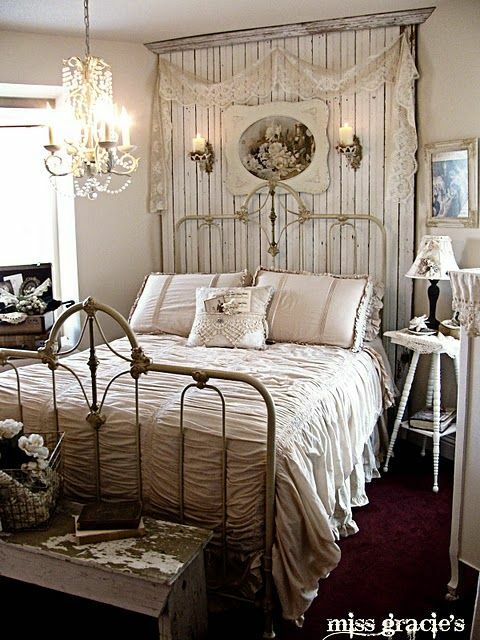 I'd have to turn it into a plug-in light because there is no ceiling fixture in the bedroom. On a completely different topic... I noticed on my blog stats that a few hundred pageviews came from Tumblr in the last month. The stats don't show anything more specific than t.umblr.com, and the search on Tumblr isn't very helpful. Anyone know how I can find out which picture(s) were put on tumblr and/or who put them there? I'm dying of curiosity! Now it's time to add the stenciling. 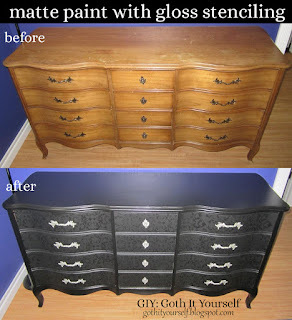 Use a gloss or semi-gloss sheen in the same color as the matte paint used on the drawer fronts. I used Behr Premium Plus Ultra in "Black." Use a stencil of your choice. 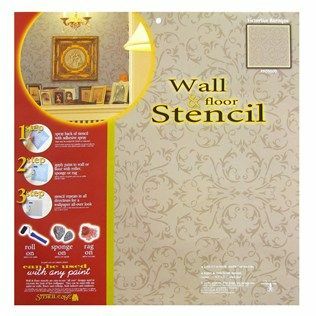 For a continuous, overall pattern, a wall and floor stencil works well. I used "Victorian Baroque" from Stencil Ease (available from Amazon). While not a requirement, stencil adhesive will make the process much easier (especially if your dresser has curved drawers!). I used Krylon Easy-Tack spray. Before you begin stenciling the dresser, I strongly recommend practicing on cardboard. Adhere the stencil in place. Load your roller lightly with paint and gently roll over the stencil. Practice will indicate how much pressure to use. Too much paint or too much pressure will cause the paint to leak underneath the stencil. Once you feel comfortable on cardboard, use the same process on your dresser. I'm sorry I couldn't get photos of the actual stenciling process. I don't have enough hands! :( But there are lots of tutorials online. Stencil the sides of the dresser. Stencil the top if desired. And stencil the drawer fronts. Next, cut liner for the drawers. Adhesive shelf paper works well, or you can use wrapping paper. I used silver wrapping paper. For regular rectangular drawers, you can simply measure the bottom of the drawer and cut the paper to size. Curved drawers are trickier. I made a pattern (the purple paper shown below). I traced it onto the back of my wrapping paper and then cut the wrapping paper along the lines. Place liner in each of the drawers. Slide the drawers into place... and your dresser is complete! 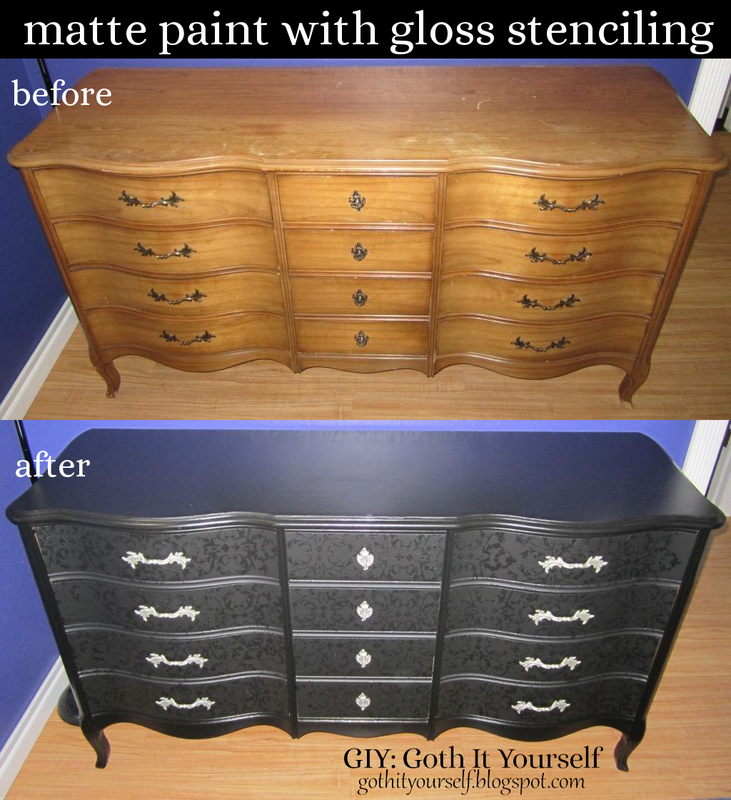 I used the same gloss-over-matte technique on a chest of drawers.